If you’re looking to market your business, using Instagram influencers might be the way to go. Whether you’re a brick-and-mortar brand or an e-commerce store, you’ll be surprised at how effective it can be to leverage on influencer marketing strategies. Spending on digital ads can end up being quite costly. Which is why endorsements and promoted posts by Instagram influencers have become more popular. And to top it off, according to the latest statistics, influencer marketing has among the highest ROIs compared to other methods of online promotions. In our guide to Instagram influencers, we explain the basics of influencer marketing, how it works, how to find influencers on Instagram, and tips on making the most out of your influencer marketing campaigns on Instagram. Influencer marketing is a type of marketing strategy that involves the collaboration of brands and popular personalities or pages. Similar to conventional celebrity endorsements and ambassador programmes, influencer marketing leverages on an influencer’s large audience and loyal following. They often get paid for Instagram posts, although in some cases influencers are willing to collaborate with brands in exchange for their products as gifts-in-kind. Top-tier influencers can command large fees and usually have a following that ranges from tens of thousands to millions of followers. Micro-influencers, on the other hand, often have much lesser followers but receive higher engagement rates from their followers. Instagram has quickly become one of the best platforms for influencer marketing. It’s a great way for brands to partner with Instagram influencers to reach new audiences quickly. In a sample study by Rival IQ, the average engagement rates of influencers on Instagram far exceeded Facebook and Twitter. 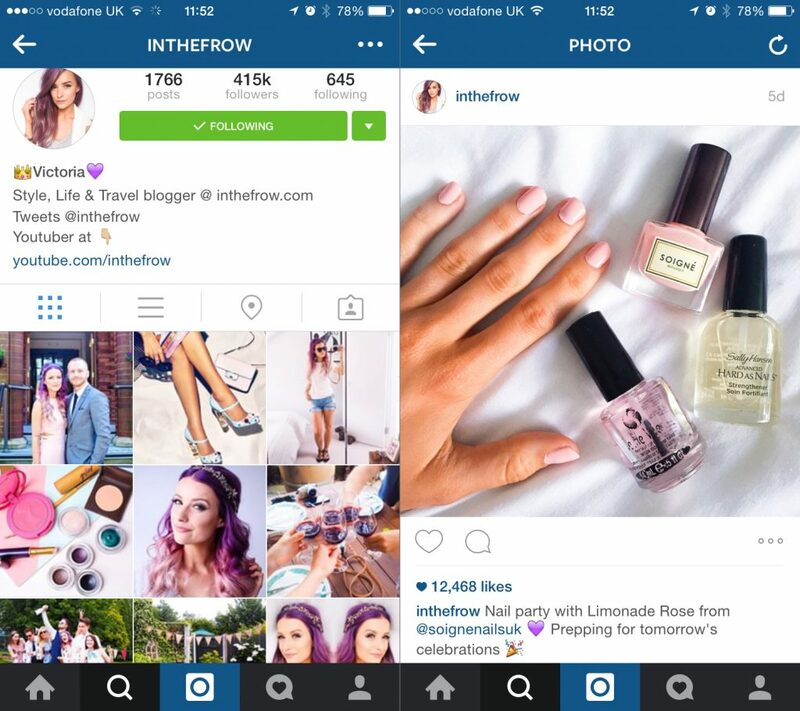 It’s not surprising that influencer marketing on Instagram works so well. While traditional marketing has become very intrusive, the new approach of reaching out to consumers through influencers has proven to be far more effective. Influencers are seen to be more trustworthy and command a lot of social influence among their followers. As opposed to one-way conventional digital ads, endorsements and promotions by an influencer create a two-way communication channel with their followers. Just like word-of-mouth marketing, influencer marketing is able to reach consumers in a softer and friendlier way. Still wondering how effective influencer marketing is on Instagram? Check out these 10 great examples of Instagram influencer marketing done right. Running an influencer marketing campaign on Instagram is a lot simpler than you think. It doesn’t involve any campaign management platform nor complicated ad buying or bidding systems. 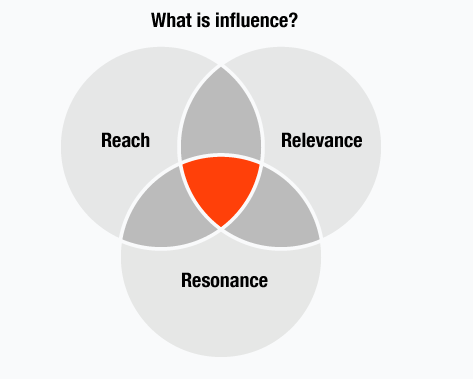 Find an influencer with followers that match your brand’s target audience. Once you’ve identified an Instagram influencer, drop them a message. Then, strike up a deal on payment terms (or gift-in-kind) as a reward for his or her endorsement of your brand or product. In your brand partnership deal with the influencer of your choice, make sure to set a time limit and use a unique code and hashtag for them to post in their post caption. It’s a simple little trick to ensure that you’ll be able to track your influencer marketing campaigns and analyze the effectiveness of different influencers. One way to find Instagram influencers is to simply use the search and discovery function on the platform. But that will be an incredibly daunting and time-consuming task. Instead, a better approach is to use Keyword Tool for Instagram. To find influencers or pages with large Instagram followers, just click on the People function and enter a keyword or topic related to your brand. From the results, you can see an entire list of Instagram influencers and popular pages related to your keyword or topic entered. Click the checkbox next to the Instagram influencer name that you want to target, and click Copy / Export all or Save (located in the bottom right of your screen). Once you have saved the list, you can proceed to experiment with related keywords to find more Instagram influencers. You’d be surprised at how easy it is to find popular Instagram accounts with Keyword Tool for Instagram‘s People function. And you might end up with dozens upon dozens of both top-tier and micro-influencers to potentially engage in your brand partnerships. Influencer marketing on Instagram has gotten so popular that Instagram itself has introduced a new feature for brands and influencers called Brand Partnerships. Whether you will use Instagram’s official Brand Partnership feature or not, it may not have a huge impact on your campaign. But if you choose the former, don’t forget to follow and abide by their partnership policies. Before you reach out to influencers and engage them in a campaign, you’ll need to have a clear idea who is your target audience. Make sure that your potential Instagram influencer’s followers match closely with your target audience. Another approach is to divide your audience into different tribal groups. For example, your brand carries a variety of products for men. You can source for influencers with specific niches within the men’s lifestyle space, like fashion, beard grooming, snickers, adventure traveling, and so many more. Each influencer can then help to promote different products or angles for your brand. By segmenting your target audience, you can approach micro-influencers and potentially increase your ROI and experience better engagement rates. It will also allow you to zoom in on more relevant audience based on specific products or brand pillars. 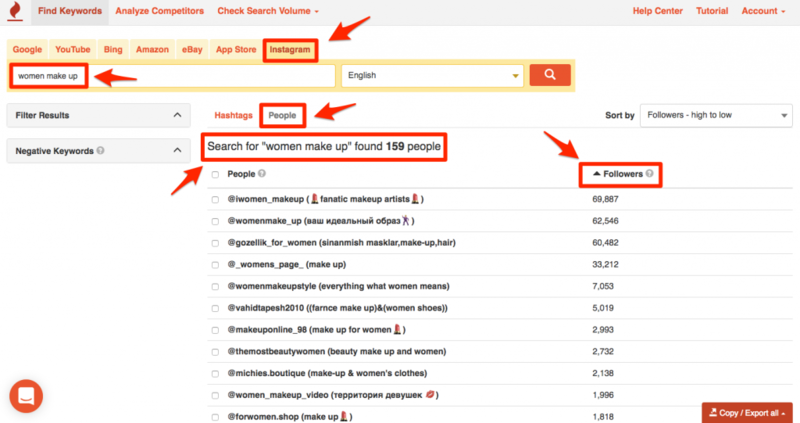 First, start by finding influencers and popular pages using Keyword Tool for Instagram. Type in a keyword or topic related to your brand or product in the People function. From the results, select a list of Instagram influencers and click Copy all / Export. Next, you should filter and select only relevant influencers for your brand. Although you may have a sizeable list of influencers with large followings, not all will end up being a good Instagram marketing partner. Take a closer look at their content and how they present themselves. Does their Instagram personality and visual look complement or enhances your brand value? If they do, the final step is to calculate their average engagement rates. 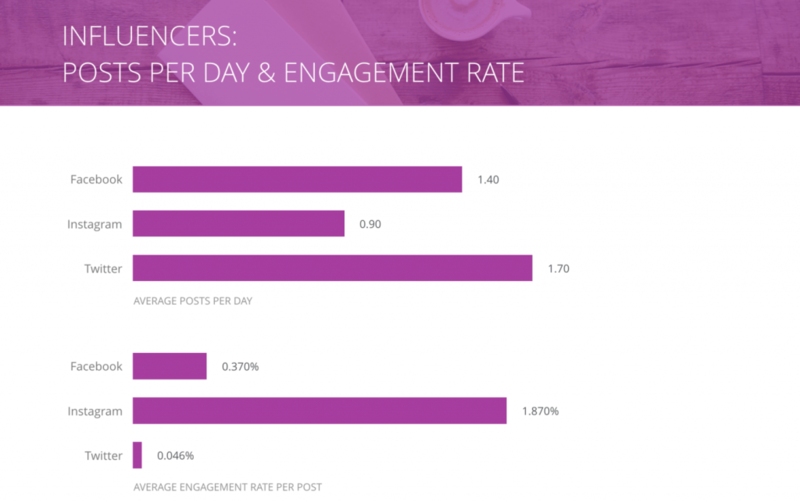 Use an Instagram engagement calculator for all the influencers in your list. As a guideline, engagement rates of at least 2-3% is the median average for 2018. The higher the engagement rate of an influencer’s Instagram page, the better it will be for your campaign. It’s definitely tempting to engage with influencers that have hundreds of thousands or even millions of followers. But loading your Instagram marketing campaign with only top-tier influencers may not be the best strategy. Firstly, they usually cost a lot. Secondly, a large following doesn’t necessarily command a high engagement rate. Micro-influencers usually only have several thousand followers (and often less than ten thousand). But you might be surprised by the fact that they can attract much higher engagement rates compared with Instagram pages with larger followings. Adding micro-influencers into your Instagram campaign may not only help increase conversion and engagement rates of your campaign but also make it more cost-effective that results in a higher ROI. Influencers are human beings after all. While some top-tier influencers are only contactable via their manager or influencer marketing agency, the large majority of influencers are pretty much self-employed. Once you’ve identified an influencer that you’d like to work with, send a DM in a professional yet friendly way. Follow their account and drop in a like or comment as well. Engage with them like how their follower would. Gary Vee, famed entrepreneur and Instagram maestro, often talks about the power of networking and building relationships through Instagram DMs. Try it yourself and you might be surprised at how easy and effective it could be for your brand. A solid influencer marketing campaign is not complete without analytics. Whether you paid big bucks to an A-list Instagram influencer or a gift-in-kind arrangement with a micro-influencer, you should know how they performed. By analyzing the numbers, like engagement and click-throughs, you’ll gain better insight into which influencer gave better ROI to your campaign. With this data, you’ll be able to tweak future campaigns to ensure they run smoother and more effectively. Use a unique code and/or hashtag to include in your influencer’s post or Instastory caption. Shorten your link to bit.ly so you’ll be able to track the clicks performance (only applicable to arrangements that require the influencer to insert your link in their bio). Set up a separate landing page for your Instagram promotion. Once you’ve created the page, install a Google Analytics tracking code. This option can be incredibly useful if you’re running an important holiday campaign (e.g., Singles Day, Black Friday, and etc.) or a big budget influencer campaign. By having a unique landing page, you can also apply remarketing campaigns to target Instagram visitors on Facebook or Google. Create a tracking spreadsheet (on Excel or Google Sheets) and include metrics like Name of Influencer, Follower Count, Impression, Traffic, Clicks, and Engagement. This document will help you keep track of your campaign in a more detailed manner, especially if you’re engaged with multiple influencers. If you have reached the end of this article, you would have a clearer idea of how influencer marketing works on social media platforms. And more importantly, how easy, cost-efficient and effective it can be for your campaign. Instagram influencers can be leveraged in so many ways; to promote a brand, sell a product, or even help to grow your Instagram page. Use this guide to make the most out of your Instagram influencer marketing campaign. And watch as your brand reach skyrocket, conversions improve, and a higher than ever ROI.